In case you’re one of the few people who haven’t heard me gushing about The University of Pennsylvania’s Coursera based Modern and Contemporary Poetry (“ModPo”) course, let me start by saying that this is the best literature course I’ve ever taken (and believe me, I’ve taken a lot of literature courses including a couple of degrees). I’ve ‘done’ ModPo like 5 times, and every time has been different and intensely stimulating to me as reader and writer. I’m excited about doing it again this year. For those new to the course or to the study of contemporary poetry, you won’t be out of your depth. The course caters to all levels and those whose struggle with the English language, who have not done much study, who have learning disabilities, or any other reason that might otherwise prevent you from enrolling in a formal course, are all welcomed and encouraged heartily - there are plenty of people and resources to help. For those who have post-graduate degrees, you won’t be bored or find the course too easy. There are many academics and teachers participating in ModPo, some of the most erudite and smart thinkers you’ll ever come across, including some of the poets we study (the likes of Christian Bök, Tracie Morris and Charles Bernstein to name a few). You can participate at whatever level suits you and there are a wide number of spin-off groups to join if you’re so inclined If you’re busy, you don’t need to read everything, or even do the essays and quizzes. You can just dip in, dabble, and play. You can also go full hog, read everything and do ModPo Plus, which is like an extra area for those who want new poems, new challenges, and more complex questions and even make your own community videos for upload. It’s all open, all free, and if you want it to be, totally immersive. ModPo opened up my perception of what a poem can do (and I thought my perception was already pretty open), and taught me to read “difficult" modern poetry in ways I never thought possible. I actually became a Steinian. I found myself really enjoying experimental forms of poetry that I would have rejected before. I became a better critic, and, I like to think, a better poet. In addition to all the goodness of ModPo itself, if you go through the course (at whatever level of engagement), you become an “alumni” and are then able to sign up to any number of Kelly Writers House discussion groups that are held throughout the year. I’ve participated in groups as diverse as Pink Floyd’s The Wall, Elaine Myles, Anne Waldman, and Emily Dickinson (to name a few). 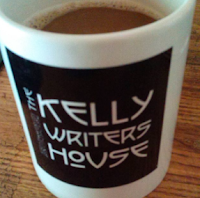 You’re also welcome to visit The Writers House at UPenn in Philadelphia for their many events, or just drop by to use their facilities, drink their coffee and eat their food - all free; all open; all wonderful. The goodness just goes on and on, and it makes you want to share too. So I’m sharing. Go - sign up: https://www.coursera.org/learn/modpo It starts on Sept 10th. You can thank me later (you will...and you wouldn’t be the first). Thank you in advance! I knew nothing about ModPo before reading your post and enthused description and invitation. I am a poet and a lover of reading poetry. I have wanted to study poetry more deeply and this sounds just perfect! Thanks for the information and the nudge in this direction! You won’t regret it, Ani! See you at the boards.